Maverick Viñales has set the pace on a rain-interrupted first day of the Valencia post-season MotoGP test while Jack Miller was 14th after mechanical issues. 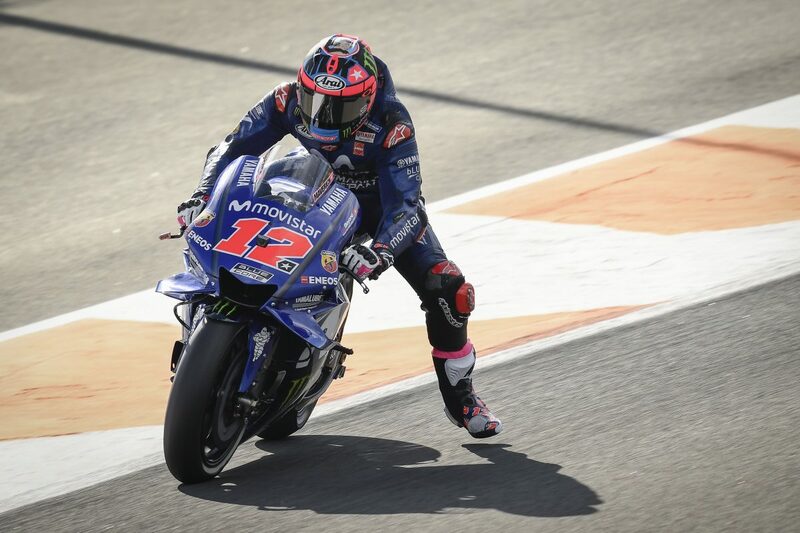 Viñales clocked a 1:31.416s with a 2019-spec Yamaha engine which took him to the top with around two hours left in play before rain soon reappeared. His Yamaha Factory Racing team-mate Valentino Rossi 0.429s back in third and Jonas Folger, the marque’s new test rider, 22nd. Marc Marquez had two spells as the fast man and ended up 0.302s off the lead as he rode two versions of the 2019-spec Repsol Honda. Both he and new team-mate Jorge Lorenzo claim to not being at full fitness and #99 was 18th-fastest. At Lorenzo’s old home, the Ducati Team, Andrea Dovizioso was only 0.001s slower than Rossi in fourth, while new factory team Danilo Petrucci was eighth and test rider Michele Pirro, the day’s only crasher, 10th. Dovizioso ran an updated GP18, Petrucci a standard and updated GP18, and Pirro a GP19. Francesco Bagnaia, this year’s Moto2 champion, was top rookie in 11th. His Pramac Ducati team-mate, Jack Miller, ended the day three positions behind due to mechanical problems with the updated GP18 he was riding. With the track also at least partially wet for the first two hours, new Suzuki Ecstar recruit Joan Mir’s 59 laps was the day’s high as he took up 15th position. Avintia Ducati’s Tito Rabat logged 36 laps in his return from a broken leg on his way to 16th.